On taking the stairs down from the Main Deck, you will find yourself on the Engineering Deck. At the front of the Engineering Deck is Main Engineering. Here you will find M/ARA Mark II warp reactor, as well as consoles and displays on Starship technology. These include detailed information on warp drives and impulse engines, and their components. 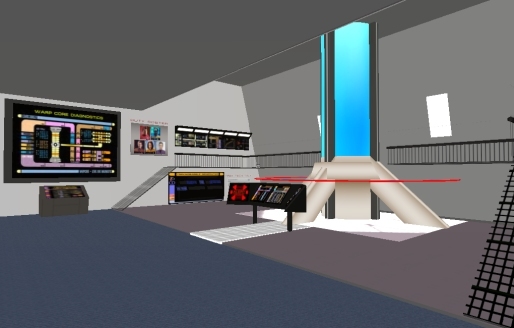 In addition to the theory and application of these technologies in the Trek universe, the displays also feature information on how these technologies relate to current real-life science and engineering - and how these technologies may even some day become a reality. There is also a technical database console which features a glossary of almost every conceivable technical term in the Star Trek Universe - from Annular Confinement Beam up to Zero Point Energy! And talking about technical terms, Main Engineering also features a Treknobabble Generator - impress/annoy friends with this display that generates the most inane pseudo-scientific gibberish! There is also a downloadable program available so you too can create your own mind-numbing Treknobabble combinations!